Find out more about His Grace's Episcopal Ministry, Coat of Arms and personal inspiration. Born in the Nigerian State of Taraba on the 31st July, 1958, Archbishop Ignatius Ayau Kaigama was ordained a Catholic priest in 1981. He worked in several parishes in Yola Diocese (Adamawa State) and, in 1995, became the first Bishop of the Diocese of Jalingo, the capital city of his home State of Taraba. In the year 2000, he was installed as the Archbishop of Jos, capital of Plateau State and on 11th March 2019, the Holy Father Pope Francis appointed him Co-adjutor Archbishop of the Catholic Archdiocese of Abuja. He is the founder of the Dialogue, Reconciliation, and Peace Centre, Jos (2011). 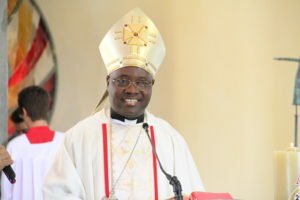 He was elected President of the Regional Episcopal Conference of West Africa (RECOWA) in Ghana 2015 and was the President of the Catholic Bishops’ Conference of Nigeria (CBCN) for six years. He has held positions as Chair of the Plateau State Inter-Religious Council for Peace and Harmony and Chair of the Christian Association of Nigeria (CAN), in Plateau State. He was also a member of the Solomon Lar Presidential Committee mandated by the Federal Government to look into the causes of the Plateau ethno-religious crises and to proffer ways of bringing them to an end. He has been invited to Europe, America and parts of Africa to share his understanding of interfaith collaboration and peaceful coexistence and also to explain the situation of the Church and the Nigerian nation. He holds a PhD in spiritual theology from the Pontifical Gregorian University in Rome, Italy and two honourary doctorate degrees in Public Administration and Human Resource Management by Godfrey Okoye University, Enugu (2015) and Madonna University (2016) respectively. Among his writings are The Trinitarian Implications of the Pauline Spirituality of Communion (1991); Dialogue of Life: An Urgent Necessity for Nigerian Muslims and Christians (2006); a compilation in 2012 of some of his peace efforts entitled Peace, Not War: A Decade of Interventions in the Plateau State Crises (2001-2011), etc. In 2010 he founded the Interfaith Youth Vocational Training Centre in Bokkos, which now falls under Pankshin Diocese, as a proactive way of arresting the circle of violence and revenge in Plateau State. In the Vocational Centre, Muslim and Christian youths study together for two years to acquire vocational skills and also learn to coexist peacefully through the art of dialogue rather than engaging in hostile confrontation over any small misunderstanding. He founded the Female Catechists Formation Centre in 2007, dedicated to forming female agents of evangelization as Catechists. He received an international award, “Golden Doves Peace Award” from Italy in 2012 as well as a San Valentino Peace Award from the Diocese of Terni-Narni-Amelia in 2013 also in Italy. He received the Religious Award of a Turkish Non Governmental Organization, the UFUK Dialogue Foundation in 2014 as well as several other local awards. Most Rev. Dr. Ignatius Ayau Kaigama is the Archbishop of Jos, Metropolitan of Jos Ecclesiastical Province, President of the Regional Episcopal Conference of West Africa, a member of the Pontifical Council for the New Evangelization, Chancellor of the Godfrey Okoye University, Visitor to the Veritas University, Abuja (Catholic University of Nigeria), Chancellor, L’université Catholique de l’Afrique de l’Ouest (UCAO) and Chancellor, Catholic Institute of West Africa (CIWA).